Diana Fitts, an occupational therapy student who works with clients on art projects and other activities that help with rehabilitation, received a Support Our Staff Scholarship for 2015-16. Sarah Arreola works full-time in the Connie L. Lurie College of Education while she completes an master’s of public administration. Sami Monsur worked full time in the Connie L. Lurie College of Education while she was completing a degree in Spanish at San Jose State. She said Dean Elaine Chin offers $500 in professional development to each staff member every year. “I was going for my bachelor’s and it really made a big difference with books,” Monsur said. After she graduated with her degree in Spanish in 2011, she decided to donate $500 to create a scholarship for other staff members who are working toward their degree. She worked with University Advancement and Financial Aid to create the “Support Our Staff” scholarship, with the inaugural award given out in 2013. 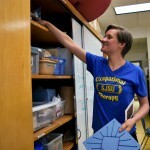 This year, the scholarship fund received enough donations to give five $500 scholarships to San Jose State staff members who are completing a degree at SJSU. Diana Fitts works as an assistant residential life coordinator while she is completing her master’s in occupational therapy. Fitts said she was inspired to pursue occupational therapy after spending time in El Salvador and the Philippines. Fitts, who is scheduled to graduate in spring 2016, said the “Support Our Staff” scholarship allowed her to purchase books that will help her prepare for licensing exams and board certification. Sarah Arreola, a specialist in teacher contracts and education projects in the College of Education, also received a scholarship this year. 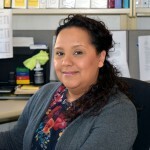 Arreola is working on a master’s in public administration. Arreola, who uses the staff fee waiver program, said the scholarship has helped with books and other school supplies. She said her twin sons look up to her, and that she and her husband talk about college often with the boys. The other 2015-16 recipients include: Amy D’Anna, a marketing coordinator in CIES who is pursuing a bachelor’s in public relations; Shawna Terry, a gift analyst in University Advancement, who is pursuing a bachelor’s in social science; and Nicole Arata, a barista with Spartan Shops, who is pursuing a bachelor’s in economics. Learn more about the Spartans Supporting Spartans campaign. Applications for 2016-17 will be available in early summer.